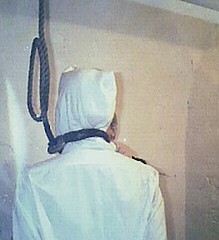 ...as the trapdoors swung open, they dropped and the rope severed the hooded head of Barzan Ibrahim al-Tikriti, Saddam's younger half-brother and former intelligence chief. Government officials said they had decided not to distribute any part of the film to the public. Iraq says the beheading was caused by a hangman's error "in setting the noose or the length of the rope." They showed the video to journalists because there was no possibility of a cover-up...the bodies were being turned over to families for burial. Here's a video of a BBC journalist describing the hanging video.